One of our many blog readers, Katie, requested that we post about our styles. One reason for the delay has been a crazy, crazy week. But I’ve also been mulling it over. It’s a hard topic to distill into a single post like this. Hopefully, it will be distilled into a single apartment, which we’ve yet to find. And bad news, our broker had a knee injury so it looks like we’ll be starting over with somebody new tomorrow. Or something. And I still don’t have a job/internship for the summer. Gulp. But back to the topic at hand. I like modern design. I grew up around modern furnishings and design elements, and that’s the aesthetic I gravitate towards. In rebellion to the rest of my household, I filled my bedroom at home with antiques when I was younger. And while I still have a healthy respect for old stuff, I tend to appreciate it more now in small doses. We’re looking at pre-war apartments mostly, so hopefully that will be represented more in architectural details. Maybe a different kind of dog. And black socks. Photo from Jennifer Greenburg. Check out her site and maybe buy her new book! But over time, I’ve also learned to like 50s kitsch in moderation. There are a few things I keep around that would fit right in at that guy’s house, and I find that style especially appropriate in kitchens. But for main living space and bedrooms, I prefer something a little more current, a little cleaner, with nods at the past without looking like it came out of the past. If that makes sense. And while I’m all about mid-century modern, the abundance of tapered wooden legs that everyone is hankering for is kind of wearing on me. 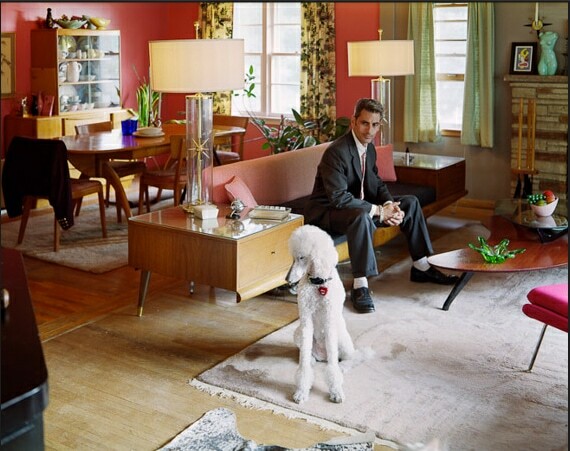 So I would say you should expect to see some modern-modern, some mid-century modern, some space-age modern, and a little 50s kitsch to keep you on your toes. It will probably qualify as a teeny-tiny space, so we’ll be trying to keep things simple and well-curated without sacrificing on the things we want. To illustrate, here are some pictures I’ve been liking, with some elements you might see popping up in the new place. 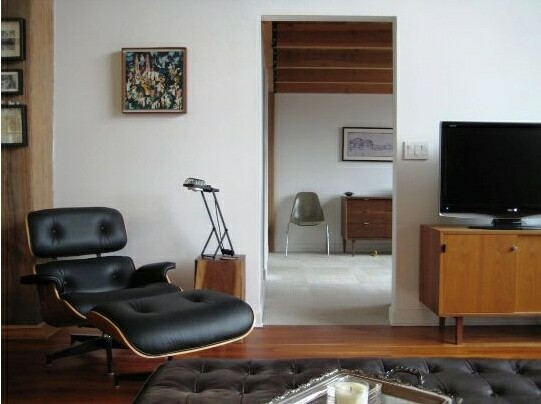 Who doesn’t love an Eames lounge chair? And the molded side shell in the back isn’t bad either. I can even dig that ornate silver platter in the foreground. A little woodsy for me– maybe a different side table?– but still. Nice. Photo from The Brick House. 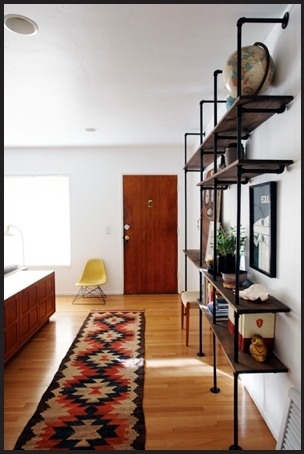 Awesome kilim, nice industrial (AND DIY!) shelving unit, and another Eames chair. From Apartment Therapy. 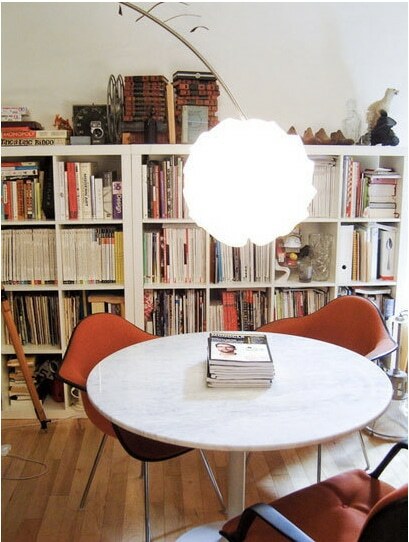 I want those upholstered orange Eames shells. You might be sensing a theme. I also love the marble-topped table, and I think having a big floor lamp as opposed to a pendant is a clever choice for a rental unit. And while I want to declutter a bit in the back, I like what they’ve done with a couple of IKEA Expedit shelving units. It’s sort of funky to see book storage in a dining area, but I think it works nicely here. From Apartment Therapy. 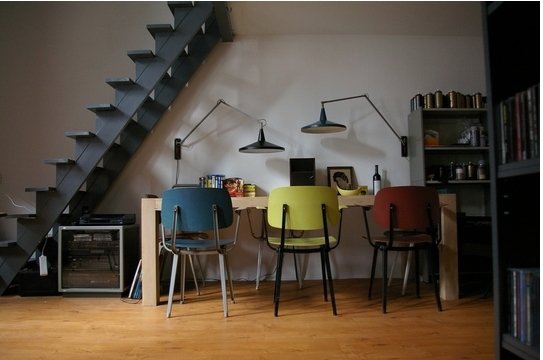 I like this workspace under the stairs. The balance of colors is so nice, and the lighting is bold and quirky without being overbearing. From Dwell Magazine. I just had to include this one. Just look at it. White cement floors? A wood-paneled wall? A four-sided fireplace? Six red vinyl-upholstered Eames shell chairs? Floor to ceiling windows? And a cool chrome pendant that makes me feel like these folks don’t take themselves too seriously? Yes please. But really, I think the mix of materials here is stunning, so even if the space is like nothing we’re going to find, we can still learn some lessons. From Apartment Therapy (EDIT: Originally from Darling Dexter). I just had to include this one because it’s a very, very small space. And I think this person has used it quite well. 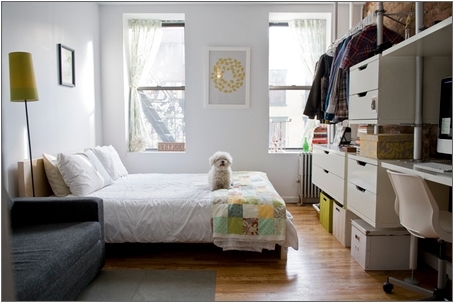 I have to respect how open and airy this looks despite that it’s quite tiny, and how they’ve worked in so much storage, a workspace, a living area, and a dog. And while the art, curtains, and quilt are a bit girly for my taste, it’s not overly-sweet or too sparse. So anyway, I hope that helped clear some things up. None of these pictures really accurately represent exactly what I’d like, but they certainly have elements you might see in our place. We’ll all just have to wait and see. I have one of those orange/red Herman Miller chairs! It is a fab chair and so comfy…ours is however on a new rocker base. Got into a bit of trouble of the hub for buying that one…ooops! That last picture is the home of Whitney Deal AKA Darling Dexter! Thank you! I’ve edited the post accordingly!